Mr. Harry Fanning was recognized for his long-time leadership and contribution to the College by serving on the SIU Alumni Board and President of CASA Board of Counselors. 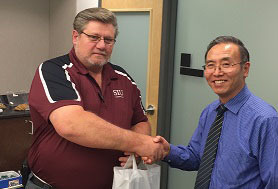 He was presented a plaque during the Board meeting on September 26, 2014. Congratulations!